If history has taught us anything, it's that big corporate shakeups at Energy Transfer haven't always been great for shareholders. Few companies look more tempting to income investors than Energy Transfer Equity (NYSE:ET) and its suite of subsidiaries. Its three largest subsidiary master limited partnerships -- Energy Transfer Partners (NYSE:ETP), Sunoco Logistics Partners (NYSE:SXL), and Sunoco LP (NYSE:SUN) -- all represent high-yield investments with interesting growth plans. Last November, the energy giant announced it was consolidating by having Sunoco Logistics Partners buy Energy Transfer Partners. While some have welcomed the deal as a way to simplify an overly complex corporate structure, there are reasons why investors, especially Sunoco Logistics Partners shareholders, should be a little concerned about this deal. The reason? Energy Transfer doesn't exactly have the best reputation when it comes to making aggressive moves. Here's a quick look at why investors may not want to be a part of the newest iteration of the Energy Transfer empire. The various entities that make up the Energy Transfer universe all have the appearance of excellent income-generating investments. Combined, they own a wide swath of crude oil, natural gas, and natural gas liquids pipelines that have an extensive geographic reach and provide essential links between production sources to demand centers such as the U.S. Gulf Coast. It also a has robust fuel wholesale and distribution business with a well-known, marketable fuel brand -- Sunoco -- that is valuable to franchisees. Furthermore, the company is in the process of building a major LNG export terminal that will utilize much of its existing natural gas pipeline network. These kinds of assets are the ideal ones for an MLP. Owners of these assets can monetize them by making customers sign up for long-term, fixed-fee contracts that insulate them from the swings of commodity prices. About 95% of Energy Transfer Partners' and Sunoco Logistics Partners' interstate natural gas transportation and storage revenue comes from these fee-based contracts. The other aspect that makes Energy Transfer attractive is its footprint in the Marcellus and Utica shale basins. While several shale basins have proven prolific over the past few years, many of them are in established oil and gas regions such as the Permian Basin. Comparatively, the Marcellus and Utica regions are places where the pipeline and transport networks are less robust and need billions in new projects to handle the development of the area. On top of it all, Kelcey Warren, the founder, chairman, and CEO, remains a significant shareholder in the business. Typically, high insider ownership is one of those cherry-on-top qualities that make for a top-notch investment since the management team has a lot of skin in the game. So you have a well-established and connected asset base that generates consistent cash flows and has ample opportunities to grow. By all accounts, Energy Transfer Equity and its subsidiaries should make for a great investment. 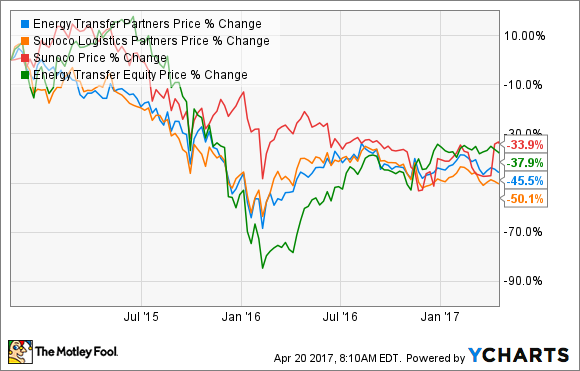 Despite all its advantages, Wall Street doesn't seem to have much faith in this group of companies. Over the past three years, share prices across the entire Energy Transfer universe have fallen precipitously ever since oil and gas prices started to collapse in earnest starting in November 2014. Some might just chalk up the decline to Wall Street's obsession with short-term performance and the constant overreaction to commodity prices. There are some underlying issues, though, that should give investors pause. Many of these matters relate to how management has handled these respective businesses over the past few years. Let's start small with Sunoco LP. The company was built as a way to consolidate all of the retail and marketing assets within Energy Transfer. Many of those assets were held by Energy Transfer Partners and were dropped down to Sunoco through a few transactions and took on several billion in debt in the process. After such large deals, it would have been prudent to focus on operations and reduce leverage. Management, however, took the "we'll grow into our balance sheet" approach instead and kept making acquisitions with money it had to borrow. This tactic came to a head late last year. Its creditors stepped in after its debt-to-EBITDA ratio had ballooned to an unsustainable 6.2 times. Since then, the company has been put on a debt diet that requires it to reduce its debt leverage. Basically, its lenders have lost some faith that management will make the right decisions about its own balance sheet. This theme of growing quickly, taking on too much debt, and then needing to change direction is a common theme among the Energy Transfer companies. Back in 2015, Energy Transfer Equity announced it was going to buy Williams Companies, but concerns about the debt load of the combined business forced it to find a way out of the deal. Also, this pending merger between Energy Transfer Partners and Sunoco Logistics Partners is marketed as a way to simplify the corporate structure and provide new growth opportunities for both. If you look into the details of the deal, though, one of the rationales is that Energy Transfer Partners is in debt trouble and at risk of a distribution cut if the deal doesn't go through. By combining with Sunoco Logistics and its better-looking balance sheet, it will significantly lower the leverage of Energy Transfer Partners. The biggest concern here is that throughout all of this, the management team at Sunoco Logistics Partners has consistently been the most conservative group among the Energy Transfer entities, a trait you want in this business. Yet when the merger is complete, the management team at Energy Transfer Partners -- the ones who ran it into its current financial woes -- will be the ones taking over. There are plenty of businesses models out there that make for great high-yield investments. But the biggest challenge with finding the right kind of high-yield investment is in hiring a management team that proves to be a good steward of shareholder capital. Despite Warren's significant interest in the business, Energy Transfer over the years has not proven to be that. The Energy Transfer group has consistently pursued overly aggressive growth plans that have led to corporate restructuring and financial engineering that has killed shareholder value. 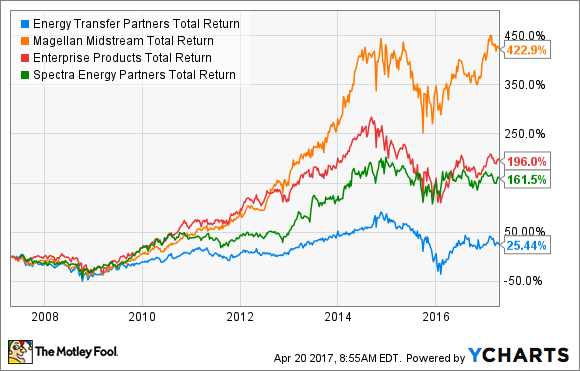 It's no wonder, then, that Energy Transfer Partners' peers have wildly outpaced it on a total return basis over the past decade. ETP Total Return Price data by YCharts. Perhaps the combination of Energy Transfer Partners and Sunoco Logistics Partners will provide some cost synergies and a larger, more diversified asset base from which both can grow. Based on management's track record, however, this could be just a way to buy time until it needs to do a drastic corporate overhaul again to preserve its financial standing, which will then lead to the destruction of more shareholder capital.